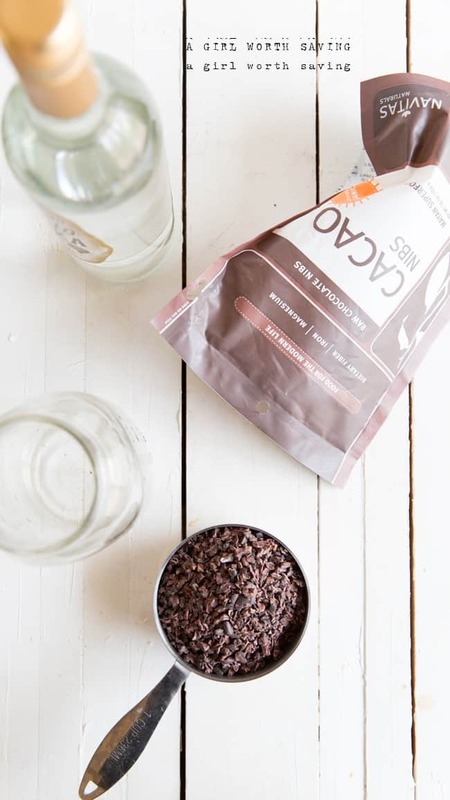 I have a weaknes in my heart for homemade Christmas gifts and I thought it was time to finally share some fun Paleo food ideas that you can give this year. I was kicking around the idea of making Kahlua but then I remembered I had given up coffee. What’s a girl to do? 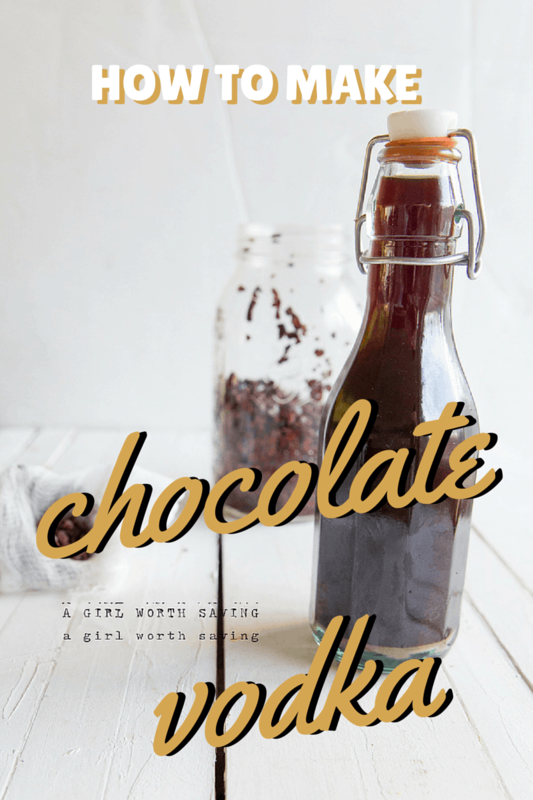 I decided to share how to make chocolate vodka. This recipe is simple as pie but it does take several days for the flavor to infuse. I will let mine sit for up to 2 weeks but you can use it after 8 days. I am a big fan of White Russian Cocktails. It was my drink of choice when I hit the young age of 21. I haven’t had one in ages since I rarely drink but I added a splash of the chocolate vodka to cream over ice and it was heavenly. It’s definitely an adult version of chocolate milk. 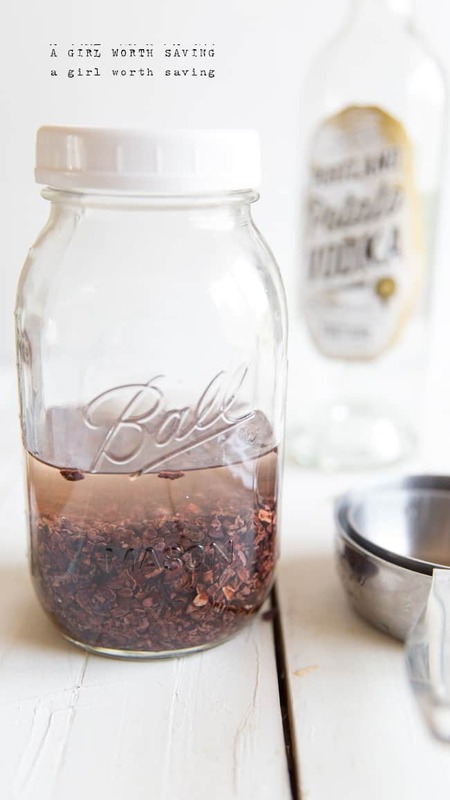 Add the vodka and cacao nibs to a mason jar and cover with a lid. Let sit on the counter for 8 to 10 days. In a small sauce pan over medium heat add the water and the swerve. Bring to a boil and then remove from the stove and let cool. Set aside. Strain the vodka through a cheesecloth and into a glass jar with a cap. Add in the cooled simple syrup and let set on our counter overnight. I just whipped up a batch last night. I use a cordial making machine from the eighties. It uses radiant energy to make the cordials in half a day rather than weeks or months. I am letting it sit in a jar for a few days. By Sunday it should be ready to taste. I’ll let you know how it is. Thanks for the great recipe. I did use all vodka instead of part water. I have really been missing my Cupcake vodka in Devil’s Food. once all the steps are completed does it need to be refrigerated if not drunk right away? Yes, I would store this in your fridge hun. Oh man, this look soooo delicious! I need to make this for a Christmas party. Wow what an awesome idea to do an infusion! 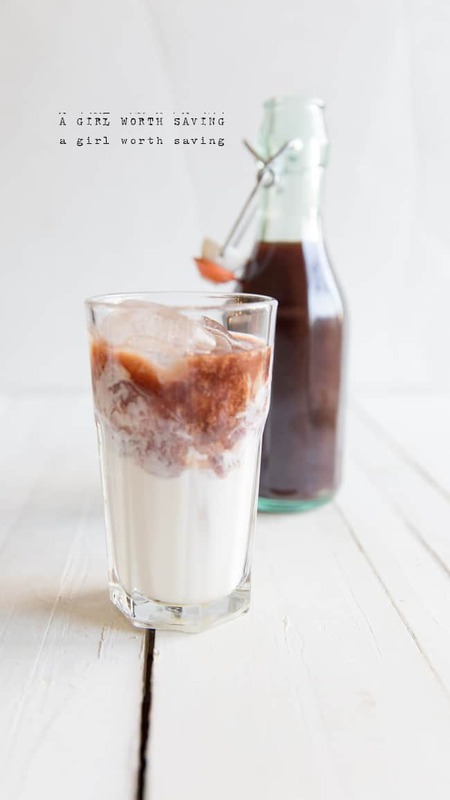 I used to love using different liquor flavors, but once I found out how unhealthy they were I stopped using them, but it never occurred to me to make my own! YUM! This looks like such a fun holiday gift idea. Wow, this is such a fun recipe!!! I would never have thought of this. I love that nibs are used! 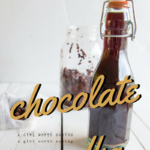 Never had Chocolate vodka before…. sounds delish! Wow! What a cool idea! I never would have thought of that. I don’t drink, but if I did I know this would be a favorite since chocolate is SO delicious! This is so fun and festive for holidays too! This is such a fun and creative gift idea! I love it!! oh you temptress you!!! I might just have to try this!! Wow ! This is so inventive ! Never though of this flavor combo. Definitely need to try it !